NOTE: This is a bit of a rant on my part, but I will get to the good stuff further down. Sorry, but I think the subject is important. 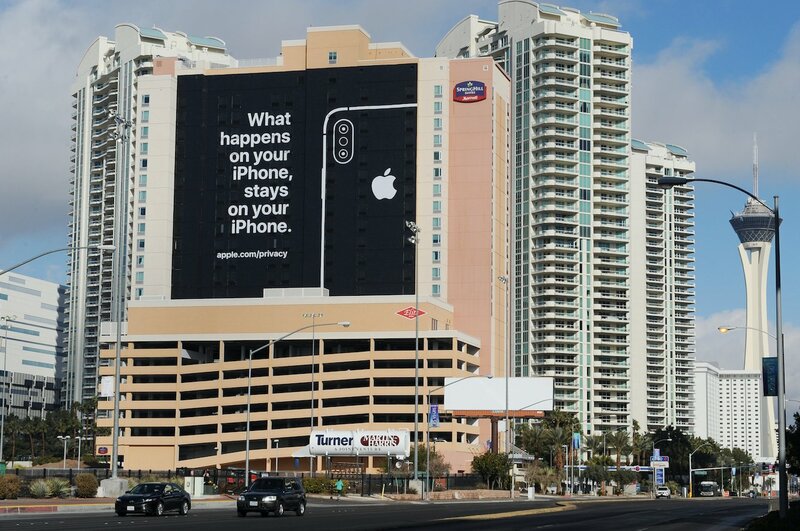 and their March Madness ad campaign”if privacy matters in your Life, it should matter to the phone your life is on” is a good thing, it does not really solve the problem. Android P or Pie, version 9, was released in March of last year. 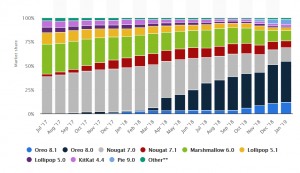 Here is the most recent distribution of Android OSes on active phones. Android Pie is represented by the light blue bars on the top in the last three bars and is a tiny percentage of the market. 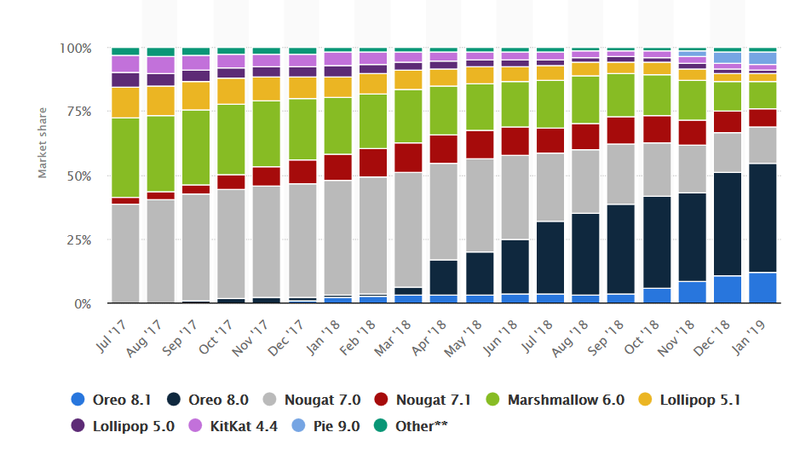 As of January, 2% of phones are still running Android 4, almost 5% are running Android 5, 10% are running Android 6, 21% are running Android 7, 54% are running Android 8 and only 5% are running Android 9 – roughly. Android 4.4, the last version of Android 4, was released in 2013; Android 5 in 2014, Android 6 in 2015, Android 7 in 2016 and Android 8 in 2017. All versions of the Android OS before version 7 are no longer supported and will never have security holes fixed. That means around 20% of the Android phones out there are unsupported and when Android 10 is released this summer, that number will rise as Android 7 support gets discontinued. While companies have been (sort of) good about getting rid of unsupported Windows OSes (like Windows XP), they have been much less active in stomping out unsupported phone OSes. As employees move more and more to using their mobile devices as a true computing device, this is becoming a bigger security challenge for all companies – one that most companies have been ignoring. THE SINGLE BIGGEST UPCOMING THREAT TO COMPANY DATA IS OLD, UNPATCHED MOBILE DEVICES. This is especially true in regulated industries where very sensitive financial, health and national security data is accessed. 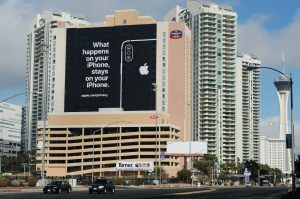 Apple has been very good about upgrading their phones to the current iOS version, supporting iPhones from the current iPhone 10 all the way back to the iPhone 5S and pretty much shoving the new releases down their user’s collective throats, whether users are happy about the results or not (older iPhones typically run slower with the newer releases). But, at least, those phones are as secure as Apple knows how to make them. But for Android phones, there are WELL over 1,000 MANUFACTURERS of Android phones and likely WAY over 10,000 phone models in use. Add to this Android’s fractured release distribution model. Users, other than Pixel users, do not get their software updates from Google like Apple users get theirs from Apple. Rather they have to wait for Google to release fixes, their phone vendors to tweak them and their phone carrier to actually push them down. Many phone vendors don’t ever release patches and that does not seem to be much of decision making consideration on the part of users (and really shouldn’t have to be). The Fortune 100 and the carriers could change this pretty quickly (like we are not going to sell your phone and we are not going to buy your phone unless you release monthly patches). but that has not happened yet. Google is trying hard to improve this. Last year they made two changes. First, they layered the operating system so that they can make (security) changes below a certain layer without affecting Android apps that carriers get paid to install on your phone and second, they began to require phone manufacturers to release patches a few times a year for two years. While this is an improvement, many people (most people?) keep phones for more than two years and don’t buy those phones on the date they were released, so while this is a start, it is not a solution. Companies need to understand that this is a risk and decide what their company policies are going to be regarding allowing users to access company data using phones that are vulnerable and unpatched. For companies that are subject to regulations such as HIPAA or NIST SP 800-171, this is a violation of the regulation and could possibly get the company fined. What is coming in Android Q (Version 10)? Phones will transmit a RANDOM MAC address (the address of the network card) to reduce sites’ ability to track based on MAC address. Only some apps will be able to obtain the device’s serial number and IMEI (electronic serial number). Users will get more control over location permissions. Now you will be able to say that an app can only access your location when it is the active application on your screen. This comes after it was released that some apps, running in the background, transmit your location data to the app maker over a thousand times a day. Only the active app can access data stored in the clipboard. Some network device state information will now be restricted. Apps will need to have access to a special FINE location API (for WiFi and Bluetooth). This is how grocery stores, for example, know that you are in the cereal aisle and can send you ads for cereal and not pantyhose. Each app will be given a sandbox regarding access to the disk on “external” storage (USB storage). Currently, if you give an app access to USB storage, they can access any data on the device. If apps are well behaved, this is not a problem, but …. There are new restrictions on apps starting in the background without telling you. There are several changes to the permissions model – apps will need to be given specific permissions in order to detect, for example, a user’s movement. One thing Apple has figured out how to do, is to get users to spend a thousand dollars on a new phone every year or two (An iPhone XS Max with 512 gig of storage costs almost $1,500!!!). Not sure how they do this, but they have. Android users are much more sensible. Until users understand that their devices (and more importantly their data) are at risk because they are not being patched, this is unlikely to change. Information for this post came from Helpnet Security. As people use their mobile devices as what one friend used to call a “pocket super computer” as opposed to something where you dial 7 digits (remember that) and talk to someone, hackers have figured out that the new attack vector is your phone. In part, this is due to the fact that finally, after 20 years of trying, Apple and Microsoft have significantly improved the security of their operating systems, making the hacker’s job more difficult (lets ignore for the moment that people are not very good about applying patches). When it comes to phones and security, we are at roughly the same point we were with Windows computers in say 1995 or so. That is not very comforting. For example, when was the last time you patched your phone? In fact, DO YOU KNOW FOR SURE if there are patches available for your phone on a regular – monthly – basis? For most iPhone users, Apple does provide patches for the operating system BUT NOT FOR THE APPLICATIONS THAT RUN ON IT. And not for old iPhones. For Android users, it is a much more complicated situation that splits the job between Google, the phone manufacturer (such as LG or Samsung or 100 other vendors) and the carrier. With one exception – Google provides patches directly to phones for Google branded phones. According to a new Verizon report, one in three organizations ADMITTED that they suffered a compromise due to a mobile device. That is up five percent since last year. And probably highly underreported. Mobile devices are susceptible to many of the same attacks as Windows and Macs as well as a whole host of special mobile attacks. And, no, Linux users are not in the clear. Remember that the Android kernel is basically Linux and the iPhone OS is basically BSD Unix on top of a Mach kernel, so all phones are Linux cousins and other relatives. And here is an interesting tidbit – OVER 80 percent of organizations BELIEVE their protections are either effective or very effective, even though less than 12 percent had implemented all basic protections: Encrypting data on public networks, changing default passwords, REGULARLY testing security systems and restricting access based on a need to know. 80% of the companies said they could spot a problem quickly. Only problem is that 63% of the problems were found by customers. Okay, so now that we have a kind of “state of the phone security union”, what should you do? First, you should create a policy regarding mobile device security. Part of that policy needs to include what mobile devices are allowed to access corporate data (for example, only phones which are running a currently supported operating system) and what happens if the mobile device does not meet those requirements. Then you need to decide how you are going to enforce the rules – software generically called mobile device management (MDM) is the most efficient way to do that and there are many vendors of MDM software. Next you need to set up the people and the processes to make this work from now forward. (If you need help with this, contact us). Not simple, not easy, but absolutely necessary. Sorry. Some information for this post came from CSO. Worried about the NSA capturing all that metadata about you? That is the stuff about you that the government says it can collect without a warrant (and courtesy of the Patriot Act) because you send it unencrypted over the Internet and so you have no expectation of privacy. A big part of the data (besides the Internet address that identifies you) is the DNS queries that you make. DNS is the phone book that the Internet uses to map that friendly name like www,foxnews.com to an IP address like 23.36.10.215 that the Internet can route. This week Google announced that it’s DNS service (the one at 8.8.8.8) can now handle DNS over TLS (meaning that your queries are encrypted) blinding not only the NSA but also making it more difficult for your ISP to sell your data as well. Since DNS is used so much, there was a lot of work done to make sure that DNS over TLS was fast, including using TCP fast open, pipelining and supporting out of order responses. You can use DNS over TLS in one of two ways and the distinction is important. The first is opportunistic, meaning it will encrypt your data if it can. The other is called strict, which means that if the receiving server won’t accept encryption, the transmission will fail. Google made support for it available for Android 9 (Pie) users Yesterday. Android 9 users will have to make some settings changes to use it. Users of older phones will have to upgrade. Cloudflare also supports DNS over TLS and also DNS over HTTPS, an older variant of it, but until the phones support it, it is unimportant what services support. Apparently iPhone users can do this to, but Apple does not support it natively; you have to do some significant shenanigans to get it to work. Health IT Security wrote an article beating up Amazon on it’s HIPAA compliance process. The article was not favorable and also interesting. The issue that they are talking about was a medic-alert style bracelet that someone bought on Amazon. After this person bought it, the vendor put a picture of it, with the lady’s name, birth date and medical condition on it in an ad on Amazon. The customer found out about it when her physician called her saying he had seen it. When the buyer contacted Amazon, she was told they would investigate. She later received an email from Amazon saying that they would not release the outcome of the investigation. So the lady reached out to her local NBC TV affiliate. It is amazing what a little bad PR can do. The TV station contacted the Amazon vendor and they apologized and said they would fix the problem. The TV station confirmed that the offending material was removed. But this post is not about health jewelry. It is to clear up a possible misunderstanding on the part of the average consumer. While Amazon may yet get into trouble for not understanding and complying with HIPAA, this is not a HIPAA issue. For consumers that use apps and other tech products there is an important lesson here. Amazon does *NOT* have a HIPAA problem. In fact, as of today, Amazon’s web site does not need to be HIPAA compliant because they are neither a covered entity nor a business associate under the terms of HIPAA. Covered entities include organizations like doctors, hospitals and insurance companies. Business associates are companies that handle HIPAA type information on behalf of one or more covered entity. That means that they have no HIPAA requirement to protect your personal information. They *MAY* have a requirement to protect it under state law in your state, but they also may not. This depends on the particular law in your state. In this case they may be in more trouble for publishing her birth date (which may be covered under her state’s privacy law) than her medical condition. It does mean that they have no requirement to protect your healthcare information under Federal law because other than HIPAA, which does not apply here, there is no Federal law requiring anyone to protect your healthcare information that I am aware of. This also includes Apple, Google and any app that is available on either the Apple or Android stores. Apple and Google are likely covered entities because of the way their employee health insurance plans work, but that is completely separate from iphones, android phones and apps. So, if one of those apps collects information from a hospital for you, for example, and makes it available to you, they can certainly use the diagnosis, for example, that you have diabetes to show you ads for diabetes medicine or supplies. It is also possible (although I think this may be pretty dicey) that they could sell your healthcare data. Depending on the state that you live in, healthcare data may not be protected AT ALL under the state’s privacy laws. This is likely because legislators are usually lawyers and lawyers rarely understand tech and often don’t understand privacy and they think that your healthcare data is protected under HIPAA. it is, but only under certain circumstances. The net effect is that it MAY BE perfectly legal to sell your health care information. If anyone thinks differently, please post a reply and I will publish it. Information for this post came from Health IT Security. If you can’t beat them on the battlefield, beat them in cyberspace. Israel has accused Hamas of creating a fake dating app and targeting both male and female Israeli soldiers to download the app. Once installed, the app has the ability to see the soldier’s location, contact list and to use the phone as a listening device and camera. The app targeted Android phone users, likely because that was easier to do. This is apparently the second generation of a surveillance app and is more sophisticated than the earlier app. The user granted the app the permissions to do all of these things, which sort of makes sense for a dating app. 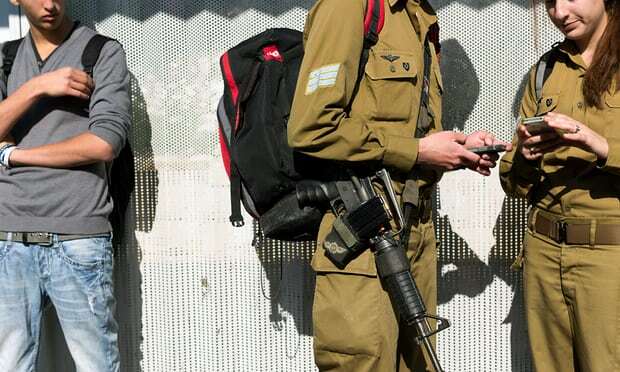 In an effort at spin control, the Israeli Defense Force said that the apps had failed to do any security damage at all, saying that some soldiers had refused to download the app and reported it to superiors. They did admit that some soldiers had downloaded and installed the app. In another situation, researchers at Northeastern University ran a small experiment to try and detect if their phones were eavesdropping on them. They took what amounts to a tiny sample of apps – 17,000 out of millions – to see if the phone’s microphone was activated. Out of this small sample, they didn’t find any. What they did find, however, may be more disturbing. They discovered that many of these apps were sending screenshots of the phone to third party domains and also video recordings of the user’s interaction with the apps. There is only a very tiny step from there to listening to you in general. The fact that these apps were doing this was not obvious to a normal user. Given this, what do you do? First, and you are not going to like this, read the user license agreement. While only some of the apps that secretly recorded screenshots and video disclosed the fact in their license agreement, some of them did disclose it. Second, if you are no longer using an app, uninstall it. If the app is not there, it is hard to eavesdrop. Finally, be cautious about installing apps. Some people never met an app that they couldn’t use. Being selective is probably just smart. This, apparently, is both an Android and iPhone problem as some of the frameworks that mobile apps are built on top of intentionally offer this screen and video capture. At least one vendor, Appsee, said they their developers are violating their license agreement by capturing user data without permission. Once they were outed by the media, they disabled the video capture for a single app and feel a lot better about themselves. Google also says this violates the Play store agreement. Gee, I am sure that any hacker would be scared about that. Other software platforms may not even care. Until Google and Apple give you the ability to absolutely, positively know if your data is being captured, you have something else to be concerned about. Information for this post came from The Guardian and Gizmodo.